Description: BNSF ES44DC 7425 with a business train. it was parked here on CP's former Milwaukee Road mainline for the GOP 2008 convention in St. Paul, MN. Description: Close up of the clean, new GE. 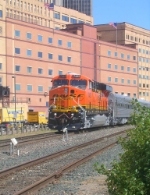 Description: The BNSF sent this train to Saint Paul for the Republican National Convention. 11 cars were behind this brand new GEVO. Description: Two BNSF units lead a train east at Little Falls. Description: A pair of pumpkins on a mixed freight drifts down toward Albion on the CSX. Description: Train #3 of 74 during the First Annual International La Plata, Missouri 24 Hour Train Watch passes the Santa Fe Depot. Title: BNSF 7239 Rocks a Z train westbound. Description: 4 GE ES44DCs (2 in the front and 2 in the rear) power a westbound intermodal. Description: BNSF 7425, 7070, 5478 and 7659 leading an eastbound stack train at Hill 582. Description: BNSF 7425 - Leads and ADM train on its way back from Texas to pick up another load of food pellets from the ADM plant. Description: Two pushers bringing up the rear. Description: BNSF 7425 leads a hot Z9 west down the Marceline Sub.